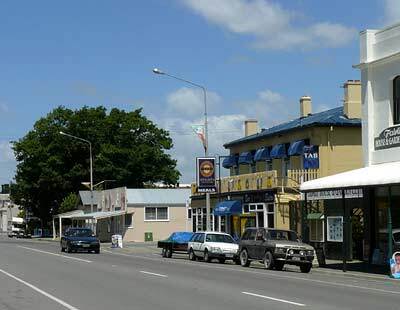 On Monday, Jan 7, we awoke with the idea of leaving Lake Coleridge Lodge after a day of rest and Wally's near recovery. However the first thing we heard, from the innkeeper, was a weather warning  100 to 150 mm of rain and high winds expected right in our area! We nearly decided to stay another night, but the satellite photos showed no rain near us, and the innkeeper said the forecasts are notoriously unreliable. So finally we decided to push on. It stayed decent, cloudy and cool at first, then sunny and in the mid to high 80s, with strong tailwinds most of the way. 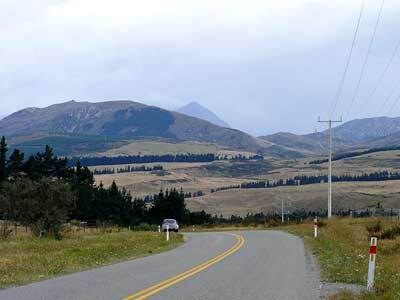 This is the countryside as we rode away from Lake Coleridge. 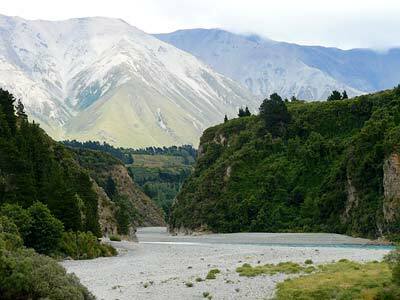 Below is a shot of Rakaia Gorge, not as impressive as we'd thought, though it looks good in this photo. Below right is more typically beautifully countryside along Route 72. Wally will try to keep the number of sheep photos under control! 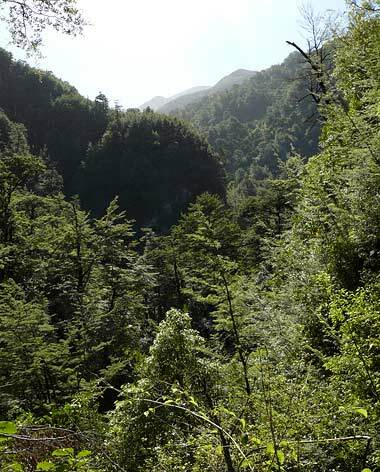 It's not easy, however, because there are so many of them, and they are simply part of the wonderful landscapes. 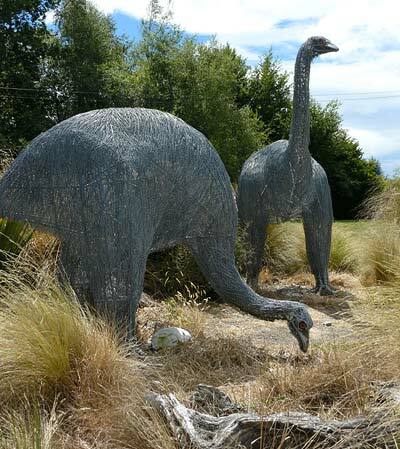 A bit farther along the way, at Alford Forest, where there is a roadside rest area, we saw these remarkable wire sculptures of the extinct Moas. 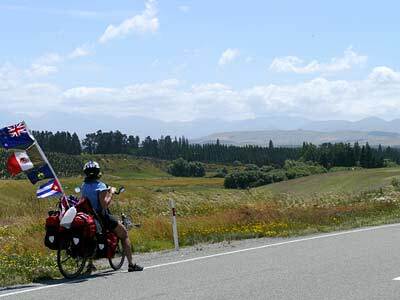 Also at this place we met two friendly cyclists from the North Island. 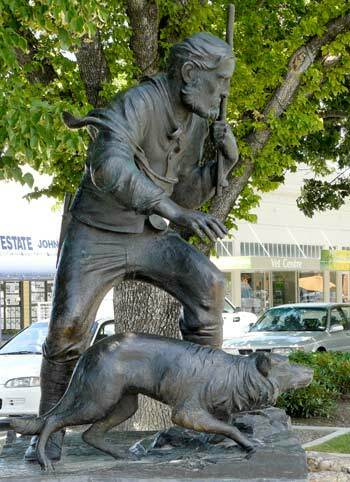 One of them is on Warm Showers, so we may well visit them on the way to Auckland. We settled down for the evening at a campsite in the quiet little village of Mt. Somers, just 65 kilometres from the start. It was inexpensive, with a communal kitchen and free clothes washing machine, a pub across the street and a reasonably well-stocked general store, so we decided to stay for a couple of nights and enjoy our first laundry day! Here in Mt. Somers we met David Gillespie and his son  a nice guy who is a member of the UU congregation in Christchurch! We aim to look him up when we get back there. By the way, New Zealanders have warned us about the power of their sun, and they're not kidding. Despite sunscreen, we are both somewhat burnt. It may be, someone said, because of a hole in the ozone layer in this hemisphere. On January 8, our layover day at Mt. Somers, we rode a few kilometers back to Stavely and hiked to Sharplin Falls. The countryside was pretty, and so were the falls, though not spectacular. 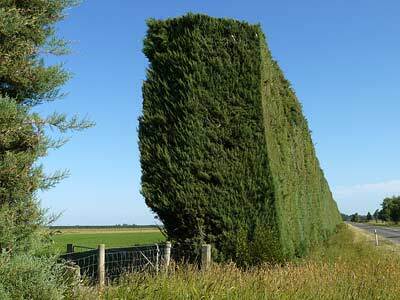 All along the ride so far, we've been impressed by the immense trimmed hedges along the fields: apparently developed as windbreaks against the northwesterlies that come roaring down from the mountains. The hedges below right, between Stavely and Mt. Somers, were among the tallest we've seen. On Thursday, Jauary 9, we set out for Geraldine, expecting to spend the night there. However, the ride was easier than expected so we continued to Pleasant Point, where there was an excellent (and cheap) domain campground. 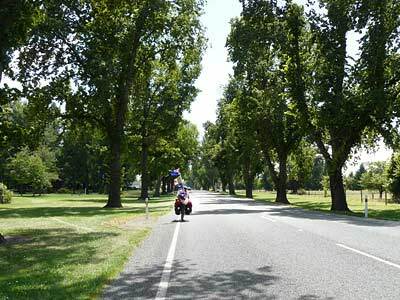 Altogether the ride to Pleasant Point was 85 kilometers, almost all either level or gently downhill  quite possibly the easiest ride we will ever do in New Zealand! Before we left Geraldine, however, something extraordinary happened. A woman came into the information office asking if Barbara were Barbara Smith. 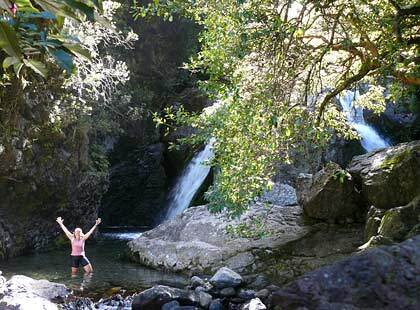 The woman owned the camping park in Fairlie, and she had received a call from Jo Munro, host at Lake Coleridge Lodge, telling her to be on the lookout for us. Barbara's credit card and ATM card had been found on the rough gravel lane to Lake Coleridge. Barbara still doesn't know how they escaped from her pack on that ride. 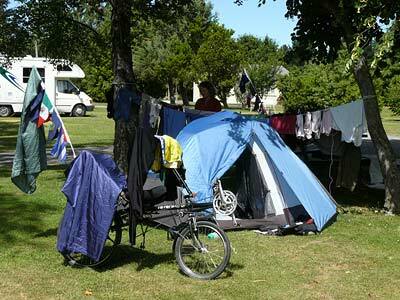 However the people at Lake Coleridge Lodge are holding the cards until we request to have them forwarded. How nice everyone was to track us down! 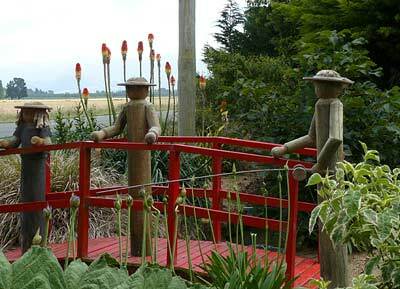 Whimsical fencepost figures are very popular around Geraldine. 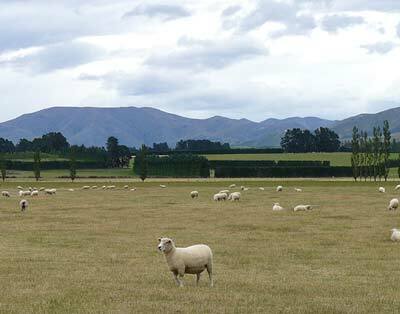 Unfortunately we didn't take photos at the domain campground in Pleasant Point  it was excellent  or of the nice Christchurch family we met there. Father ran a jetboating company, grandmother was an avid cyclist who'd just returned from a 1600 kilometer mountain biking expedition in Australia, all this at 71 years of age! Leaving Pleasant Point, we rode west on Route 8 to Fairlie. It was a scenic, rolling, surprisingly quiet road, shown on the left, and only about 45 kilometers long.